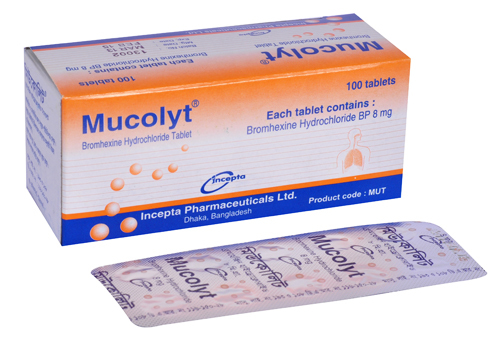 Mucolyt Tablet: Each tablet contains Bromhexine Hydrochloride BP 8 mg.
Mucolyt Syrup: Each 5 ml syrup contains Bromhexine Hydrochloride BP 4 mg.
Mucolyt is a highly effective mucolytic expectorant. 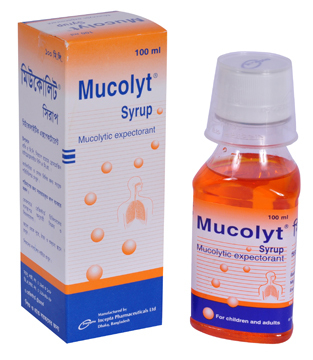 Mucolyt is indicated in the treatment of respiratory disorders associated with productive cough. These include; tracheobronchitis, bronchitis with emphysema, bronchiectasis, bronchitis with bronchospasm, chronic inflammatory pulmonary conditions and pneumoconiosis. Adults and children over 10 years: 8-16 mg 3 times daily. Children 5-10 years: 4 mg 3 times daily. Adults: The recommended daily dose is 2 to 4 teaspoonful 3 times. Initially 4 teaspoonful 3 times daily and then as required. Children: Suggested dosage for children under 2 years is 1/4 teaspoonful 3 times daily, for 2-5 years 1/2 teaspoonful 3 times daily and for children aged 5-10 years 1 teaspoonful 3 times daily. Gastrointestinal side-effects may occur occasionally with Bromhexine and a transient rise in serum aminotransferase values has been reported. Other reported adverse effects include headache, dizziness, sweating and skin rash. Since mucolytics may disrupt the gastric mucosa so Bromhexine should be used with care in patients with a history of peptic ulceration.